WASHINGTON — The U.S. has not done enough to reinforce its own and NATO's nascent efforts to fight Russia's prolific propaganda against European allies, the top military commander in Europe told lawmakers Thursday. 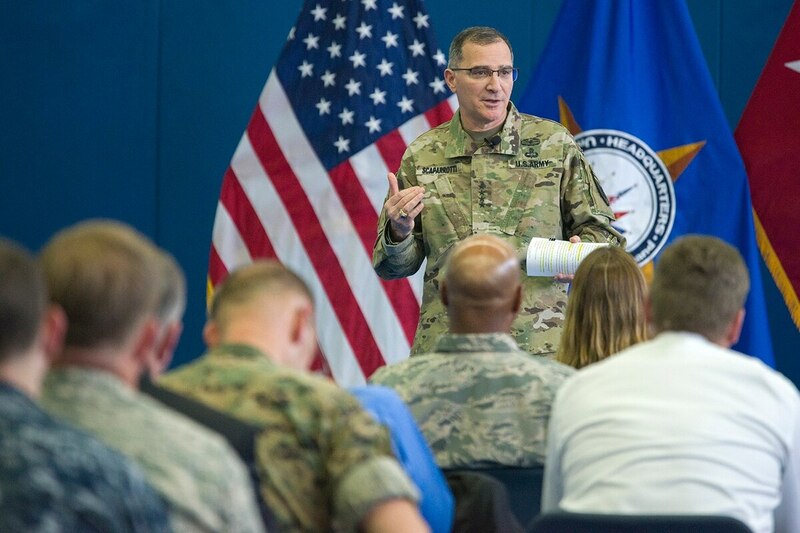 Army Gen. Curtis Scaparrotti, NATO's supreme allied commander in Europe and chief of U.S. European Command, said both should do more to confront Russian disinformation campaigns. "I think we're focused on it, I don't think we've had enough of a response at this point," Scaparrotti told the Senate Armed Services Committee. "We have to both as the U.S. and also as allies come together and take a more aggressive confrontation of Russia, particularly in this grey area." The general recommended bolstering two existing efforts, beyond the military's one-off tactical efforts. The Russian Information Group, co-chaired by his command and the State Department, should be reinforced, financed and granted expanded legal authorities, he said. There's also the State Department's Global Engagement Center, whose scope includes countering disinformation from state and non-state actors, but "it's not robustly supported," he said. "I think the United States, we have an organization to effectively operate, what we need to do is policy and things that flow from that, a whole-of government approach," he said. "That's not what we have in the way that we need it today. … We have an adversary here who's using it to very good benefit." It's a question of national will, Scaparrotti said, "I think we have all the talent we need to do this better than anybody else, we just have to decide to do it." Russia views information as a war fighting function, but it's efforts are spread across a broad set of groups, including its intelligence community, and can be executed across on social media, in cyberspace and through television, the general said. His comments come after the White House released a 2018 budget outline with deep cuts to the State Department, among other non-defense areas, and after news broke that Secretary of State Rex Tillerson plans to skip a semiannual meeting of NATO foreign ministers. Senate Armed Services Committee Chairman Sen. John McCain, R-Ariz., pointedly asked Scaparrotti: "It wouldn't help if we slashed spending for the State Department?" Lawmakers of both parties voiced concerns about whether the U.S. was doing enough to support NATO allies and confront Russia — particularly amid reports Russia secretly deployed new cruise missile in violation of the Intermediate Range Nuclear Forces Treaty — and about cutting diplomacy in the face of Moscow's full-bore propaganda effort. Several were concerned Moscow would attempt to interfere in European elections as it had in U.S. elections. The general did offer some reassurances about the U.S. commitment to NATO, recalling the remarks of Vice-President Mike Pence and Defense Secretary Jim Mattis at a recent summit of allies. He also said that Tillerson had just met with the NATO secretary general and that they are working to find a conference date that can accommodate all allied foreign ministers. "We're absolutely committed to the alliance and continue to be a leader in the alliance," Scaparrotti said. Sen. Claire McCaskill, of Missouri, the ranking Democrat on the Senate Committee on Homeland Security and Governmental Affairs, had the sharpest criticism for the administration, which has a cloud of Russia-related controversy hanging above it. It undermines military efforts, McCaskill said, when President Donald Trump is unwilling to condemn Russian President Vladimir Putin. "A big piece of it is having a commander who will say the right things to Russia, and we do not have a commander in chief right now who is willing say out loud what everyone knows about Putin, what he did in Europe and what he tried to do in the United States," McCaskill said. "Until we have a commander in chief who is willing to speak out against this thug and his behavior, I don't know that all the great work you and your command are doing is ever going to move the needle." On the conventional military side, Scaparrotti told lawmakers he has recommended his command's posture be strengthened in the face of Russian aggression. Chiefly, the U.S. has to boost command and control efforts "in a dynamic environment against a foe like Russia," he said. To counter Russia's anti-aircraft 'A2-AD,' or anti-access and area denial capabilities, the U.S. must continue to modernize long-range precision munitions and electronic warfare capabilities, Scaparotti said. More broadly, the general recommended investment in the following areas: ISR collection platforms to improve timely threat information and strategic warning; land force capabilities to deter Russia from further aggression; enhanced naval capabilities for anti-submarine warfare, strike warfare, and amphibious operations; prepositioned equipment to increase U.S. responsiveness to crises; and enhanced missile defense systems. "We must invest in the tools and capabilities needed to increase effectiveness across the spectrum of conflict," he said. "And we must ensure that we have a force that is credible, agile, and relevant to the dynamic demands of this theater."